Today we finish up Paul’s time in Philippi. When we left Paul and Silas last Sunday, they were locked up below the jailhouse. Paul’s accusers were upset with him because he’d freed one of their slaves from a demon which had allowed her to make prophecies about the future. They’d profited from this ability of hers, which was lost once the demon was gone. But that’s not the kind of thing one can take to the police and to have someone arrested. So they trump up charges that Paul and Silas are Jewish agitators, who are disturbing the peace and breaking Roman laws on religion. The crowd joins in and soon the two of them were beaten and taken away to jail. This is where our reading begins. Read Acts 16:25-40. It’s been a crazy weekend. 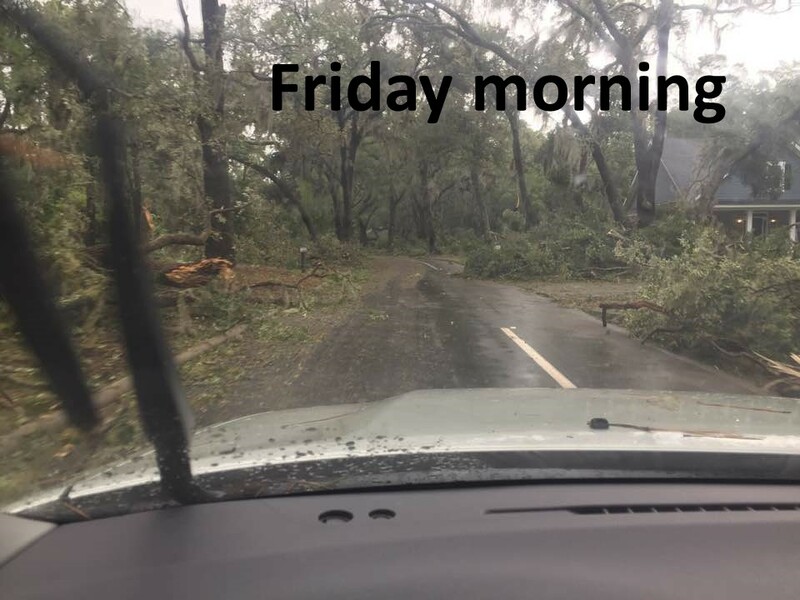 I hope you are all recovering from the storm on Friday morning. For many of us, Labor Day will be just that, laboring to clean up everything! Thankfully, no one was hurt, for which we should give thanks. That’s what today’s message is about, giving thanks to God under all circumstances. You know, people in the Bible do some crazy things. 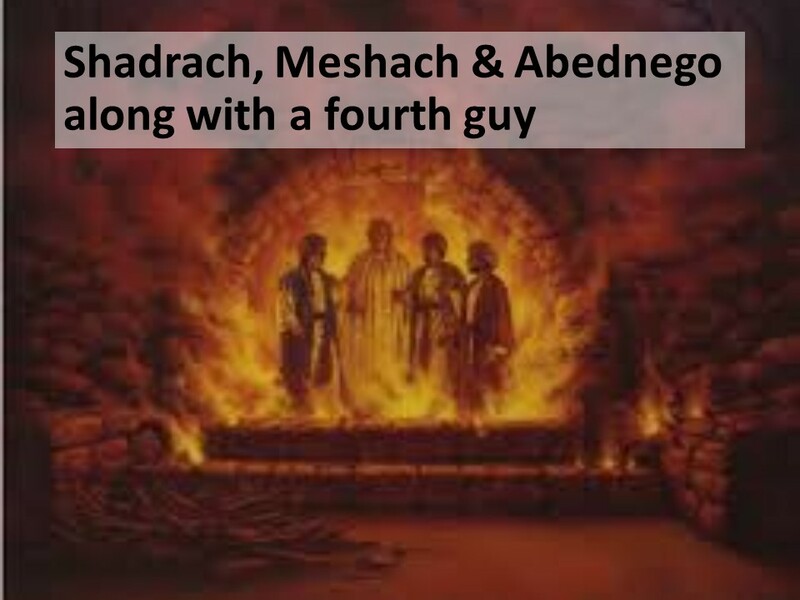 In the book of Daniel, we learn about the Shadrach, Meshach and Abednego taking a stroll inside the fiery furnace even though the guards who threw them into the furnace were cooked just by being too close to its door. And then there is Daniel bedding down with Lions. These young Hebrew men trusted God for their deliverance. They survived safely. But it’s not always that way. 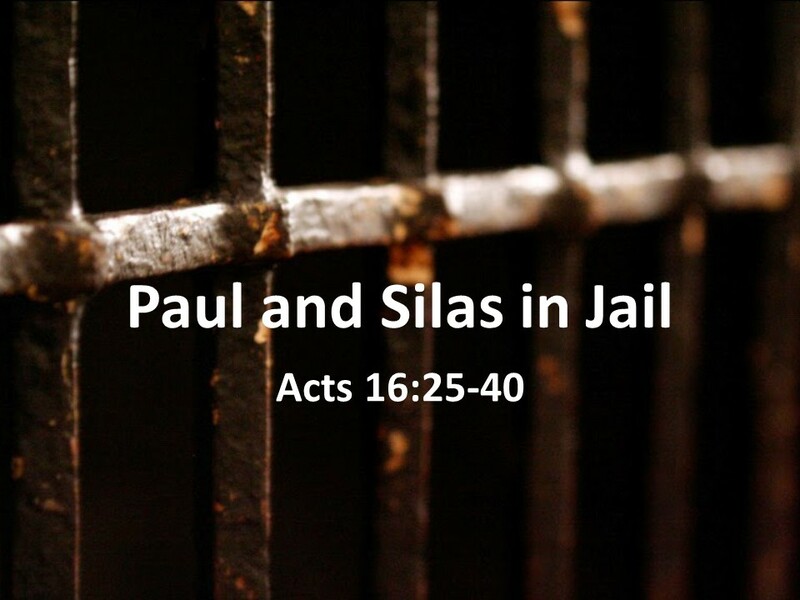 Our reading begins with Paul and Silas in prison. 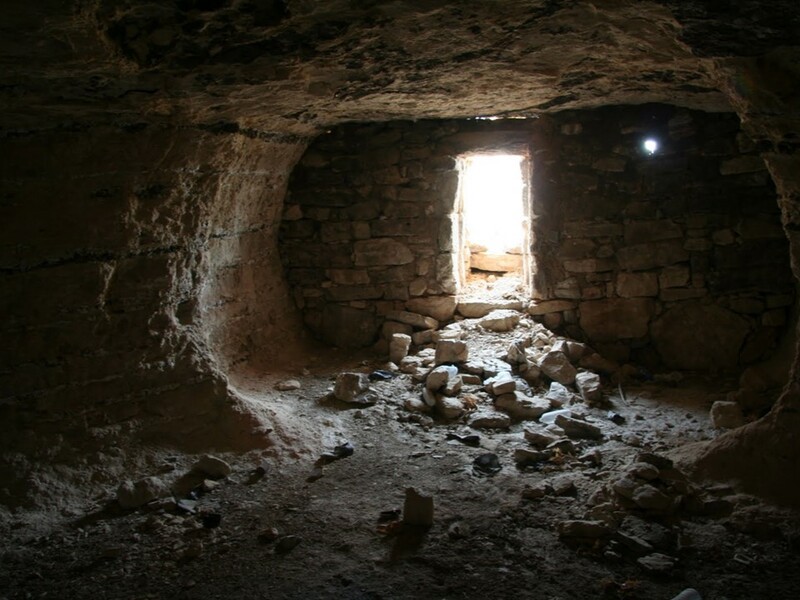 We’re not told what happened to Timothy and Luke, who were companions of Paul and Silas at this time, but some suggest it has to do with Paul and Silas Jewish ties. The other two, being Gentiles, may have received a free pass. But Paul and Silas are in jail. Instead of complaining, demanding a lawyer, or threatening the officers who arrested them, they sing hymns. That’s right, sore and beaten, they make joyful noises to the Lord. Legs in stocks and in a cell in which their voices echo, they lift up God’s name in praise. As the cliché goes, “When life gives you lemons, make lemonade.” Singing in chains goes beyond lemonade in my book. 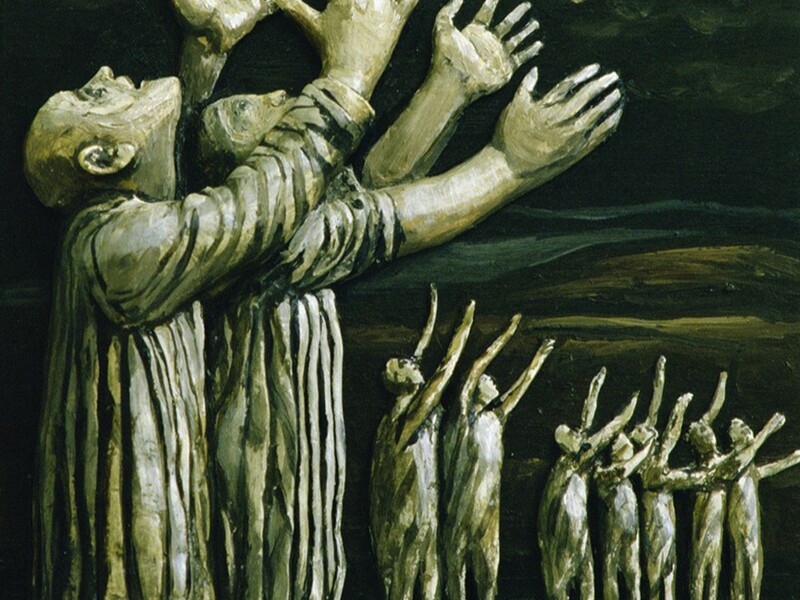 As they sing, God sends a strategic earthquake that opens the doors and loosens the chains. Obviously, their prayers are answered. The door is ajar, the chains securing the stocks have fallen off, and it’s night outside. By sunrise, in this age devoid of fast communication, they could be in another town where they’re not known. This is what we expect. 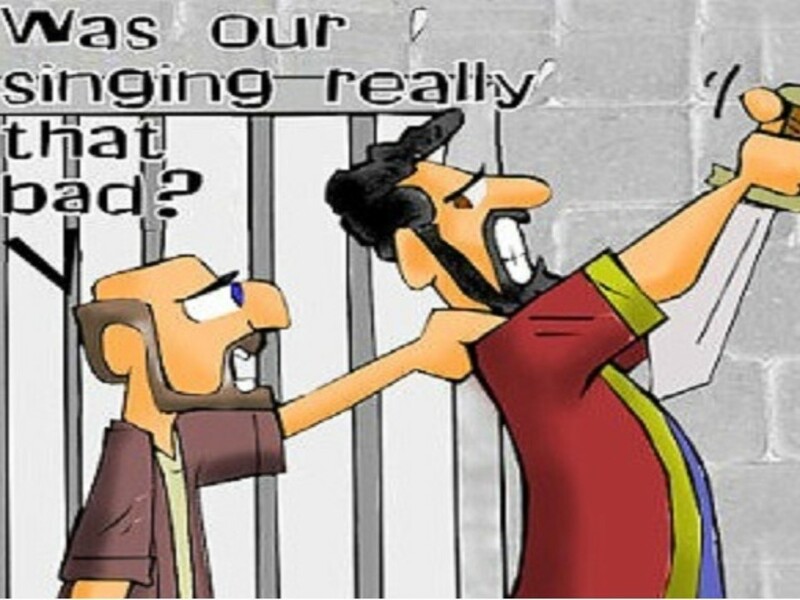 We’ve seen it already in Acts; God’s not beyond a good jailbreak. Back in Chapter 12, an angel freed Peter from jail. But Paul and Silas don’t run. They stick around and see that the jailer, who is about to do himself in for having let prisoners escape. Paul cries out and reassures him that none of the prisoners have escaped. This witness, sticking around when he could have run, is such a testimony that leads the jailer to ask Paul what he needs to do to be saved. How did he know to ask? 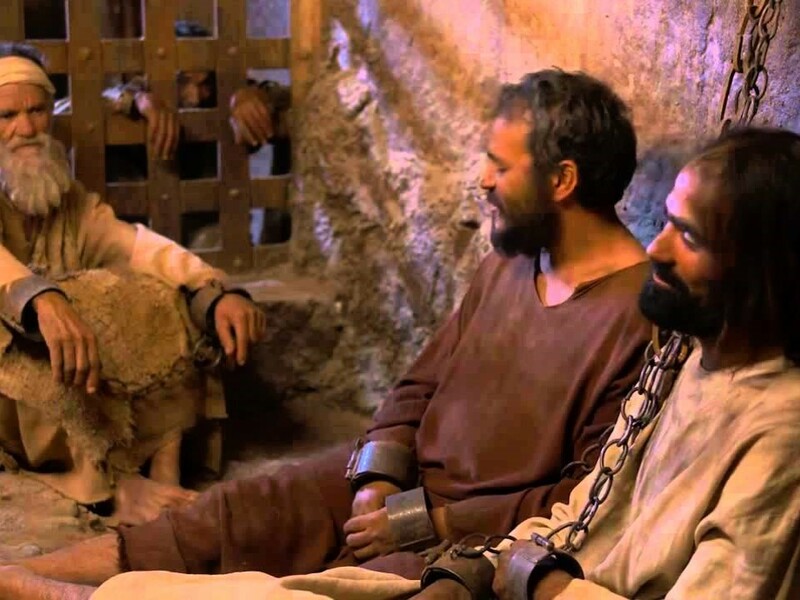 Perhaps he heard the slave girl, the one’s whose deliverance resulted in their arrest, going around saying that these men are proclaiming the way of salvation. 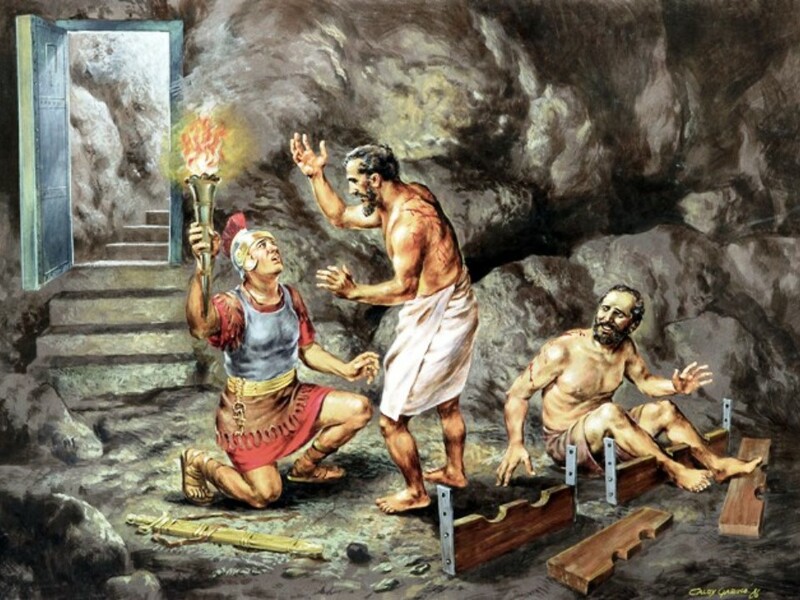 The jailer and his family become the third occasion for the power of Jesus to be experienced in Philippi. By sticking around, Paul and Silas saves his life. If they’d escaped, he’d either done himself in or would have been “done in” by the Roman authorities. But now he realizes there is something these jailbirds who have been singing all night have that he wants. 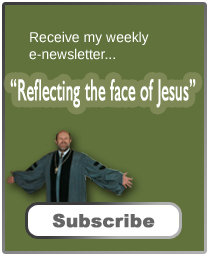 “What must I do to be saved?” Paul tells him the good news, and he accepts Jesus Christ. He and his family are baptized and everyone is happy that he’s now a believer. He’s twice saved this night. In return, and in gratitude for his experience of salvation, he nurses the wounds of Paul and Silas and feeds them, but he can’t let them go free. That has to happen through the courts, which won’t be long in coming. In the morning, when the authorities learn that Paul was a Roman citizen, the trump card he’s holding in his back pocket, the judge is more willing to release them. They want them out of town. Treating a Roman citizen in the way Paul had been treated was a grave offense, and they want the evidence gone. But Pal and Silas demand to be released publicly, not secretly, and before they leave town, they visit Lydia and the other believers who are gathered at her house. They want to reassure and encourage them before they leave. The story of Paul and Silas in Philippi has all the necessary components for a movie. There are joyous and sad occasions. The outcome is always shifting, making you guess what’s going to happen. So much of life is like this—our hopes are shattered yet the troubling times lead us to new discoveries. Like Paul and Silas, we need to count our blessings and keep our eyes on Jesus and make the best out of things even when the world seems stacked against us. 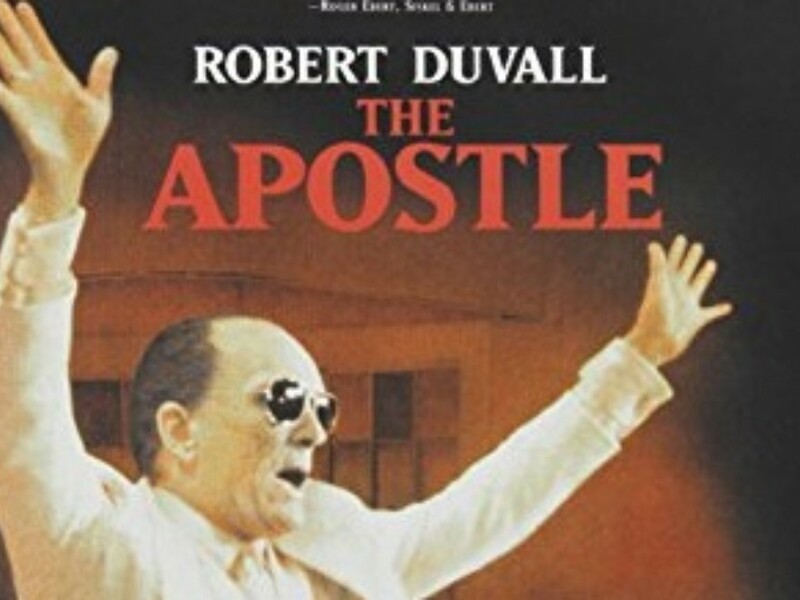 One of my favorite actors is Robert Duvall. Back in the 90s, he directed and starred in The Apostle. The movie was about Sonny, a preacher who in a fit of jealous rage strikes out with a baseball bat at the head of his wife’s lover. The man dies and Sonny is on the run. Sonny has always talked to Jesus, and he does plenty of this as he tries to recreate himself. He slowly makes his way back into a new ministry as he helps out folks who are down-and-out. Things begin to look up for Sonny, but he’s still a fugitive. It’s just a matter of time before he’s discovered by the law. The movie ends with his arrests, but then as the credits run, we’re giving a vision of Sonny in the future. He’s working on a chain gang. The convicts are all chained together, with swing blades, cleaning out a ditch. And as they swing, Sonny sets the tempo as he sings a litany of God’s praises. He other prisoners join him. 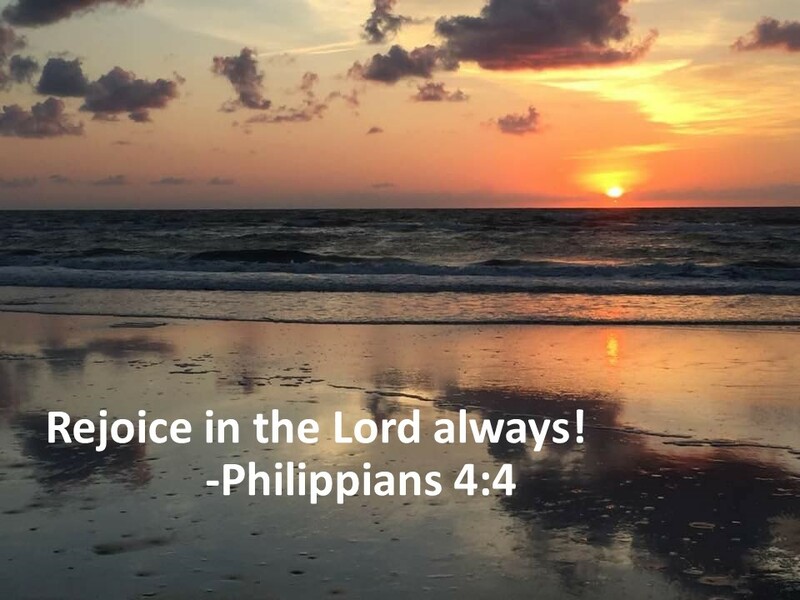 Later in his ministry career, the Apostle Paul wrote to the Philippians while imprisoned, encouraging them to “Rejoice in the Lord Always.” Many of those reading the letter may have recalled Paul’s singing in the local jail. Paul advices us to always trust God. It helps us maintain a better attitude and more importantly, it allows us to have a more effective witness for Christ. Do we? Do we trust God enough to always rejoice, to praise God in times of plenty and in want, good and bad? Remember how Paul and Silas acted in prison and the next time you face disappointment or a setback in your life, give thanks! There can be no better witness for our faith in Jesus that to be grateful even when things are not exactly going our way. May our hearts always sing God’s praises. Amen. Psalm 22:1, Matthew 27:46, Mark 15:34. See F. F. Bruce, The Book of Acts (Grand Rapids: Eerdmans, 1986), 335. Philippians 4:4 (for Paul’s imprisonment, see Philippians 1:13). 1. When Paul and Silas were arrested, who was the IPO in charge of their case?